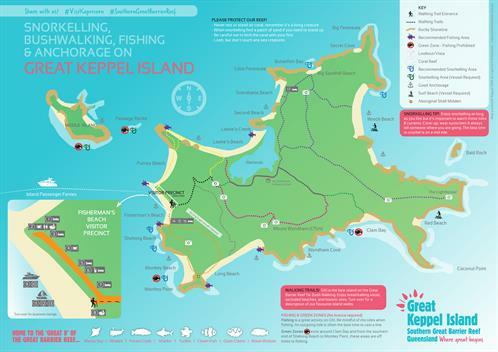 The Keppel Island Group consists of 14 islands, with Great Keppel Island being the largest (43 kilometres in circumference; approximately 3,500 acres). The majority of the other islands are National Parks, some available for camping with a required camping permit. Due to the central location of Great Keppel Island, we enjoy a warm, sunny climate and safe swimming beaches year-round. Visitors to the island step ashore to unspoilt bushland surrounded by 17 pristine, white sand beaches, private coves, and pockets of fringing reef, excellent for swimming, snorkelling and diving. Ninety percent of the island is bushland with many bushwalking tracks to explore the interior and have access to secluded beaches. The GKI Holiday Village is simply the essence of Great Keppel Island accommodation. Holiday on the Great Barrier Reef in cabins, tents, twin rooms, backpacker dorms or island camping...all in laid back island style.